I have an update coming on this story that might interest many people. It was the story Sheriff Ozzie decided he would jump in on. Even though I made it quite clear to PIO Shane Phillips that I knew the real story behind the IA Website, and tried to get a Public Explanation several times however Chief Meidl decided to completely ignore me. I would suspect hoping I would just go away. 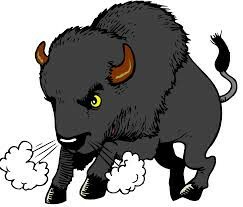 In Law Enforcement Leadership School, they teach wood be Leaders that the best thing to do as far as image and respect are concerned is to “Fess-up and Face-up” unfortunately local Law Enforcement Leaders must have forgotten that part of the classes. I even went so far as to warn PIO Shane Phillips, that I had copies of the IA Reports, but that didn’t do any good. 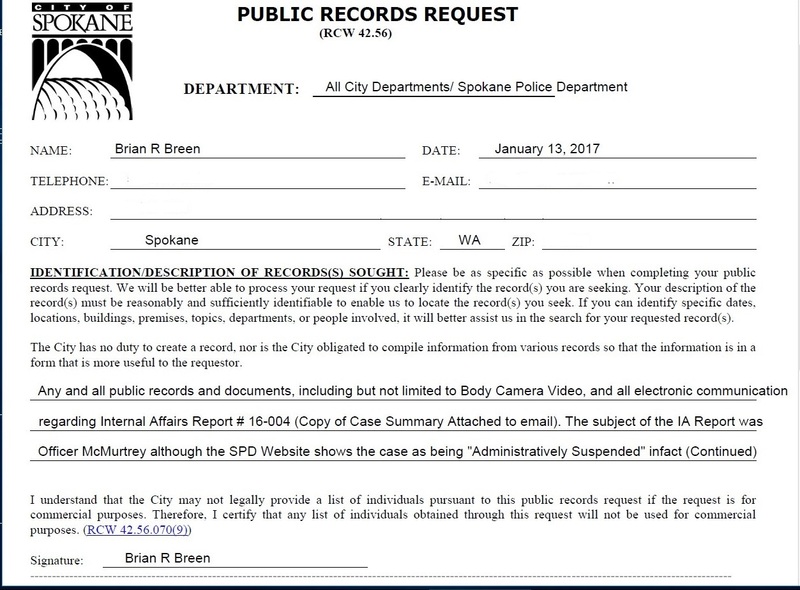 There are IA Cases on the SPD Website that certainly appear to be efforts to hide the truth from the Public. I am going to start with this one, because it demonstrates just what I’m talking about. The actual truth is that the Subject Officer, Christopher McMurtrey went completely out of control (It ain’t pretty) on an arrested subject. 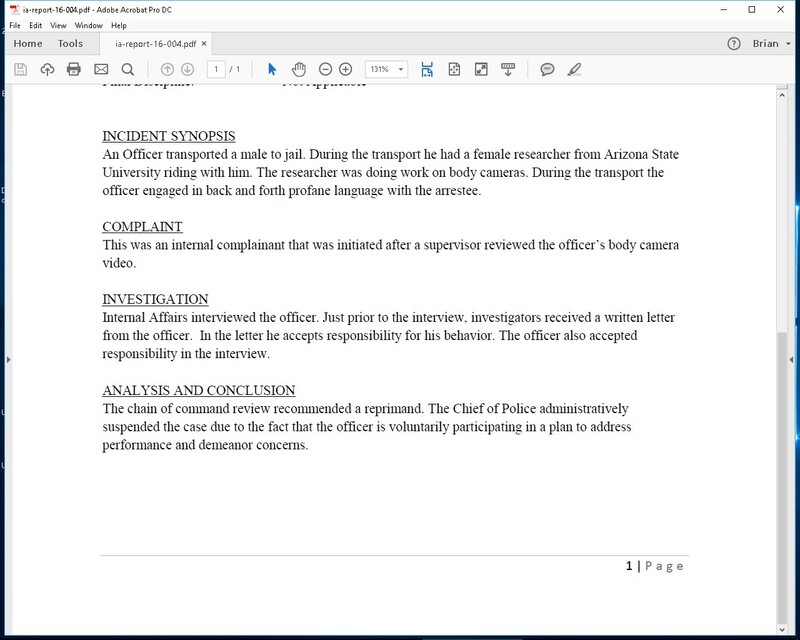 Ironically his behavior was captured on Body Cam Video, and to top it off a female Body Camera Researcher was with him. The case and the way efforts were made to hide it from the Public just amplify the idiocy of having Chief Craig Meidl’s wife in charge of IA. The images below show the Public Records Request I made today and should provide some insight. You might note the care I had to take in getting the Body Camera Video requirements in under the NEW PRA LAW regarding the restrictions in getting BC Video, something the other local press hasn’t covered to any extent. This could very well be a test case regarding the new law depending on how Meidl and the Mayor want to play it. Previous PostGOOD OLD SPOKANE STUFF!! !Next PostTERRY vs OHIO, THE BROKEN WINDOWS THEORY? Why would an officer act like such a jerk, especially with a witness around? Too much cocky confidence that there is little to no accountability for police misconduct? I mean, beyond the city’s toothless police oversight ombudsman thingy? I’m a strong advocate for Body Cameras, and one of the theories for their use it that they make Cops behave better, which I think is probably true. However, if Cops have little or no concern about the footage becoming public because they rely on their leaders to try and withhold the footage from public inspection because it reflects poorly on their leadership why behave? That is one of the reasons I’m taking this on. I anticipate the City will try to claim a number of exemptions to the PRA, but I hope not because the reality is and always has been Face-up and Fess-up if you want to gain Community respect. I of course haven’t reported everything I know but IMO this case represents the ongoing issues of a lack of transparency that the City Council and the Public Safety Committee need to address. 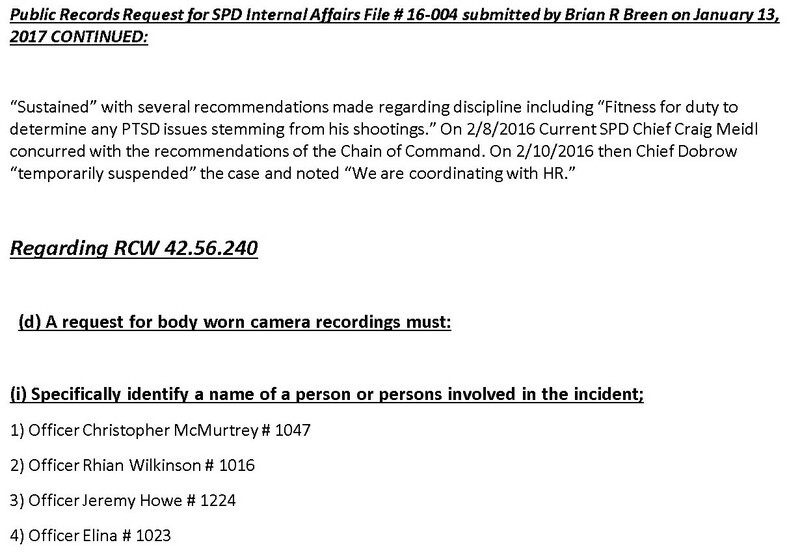 It also IMO offers up a good case to test the new Body Camera exception restrictions in the PRA. 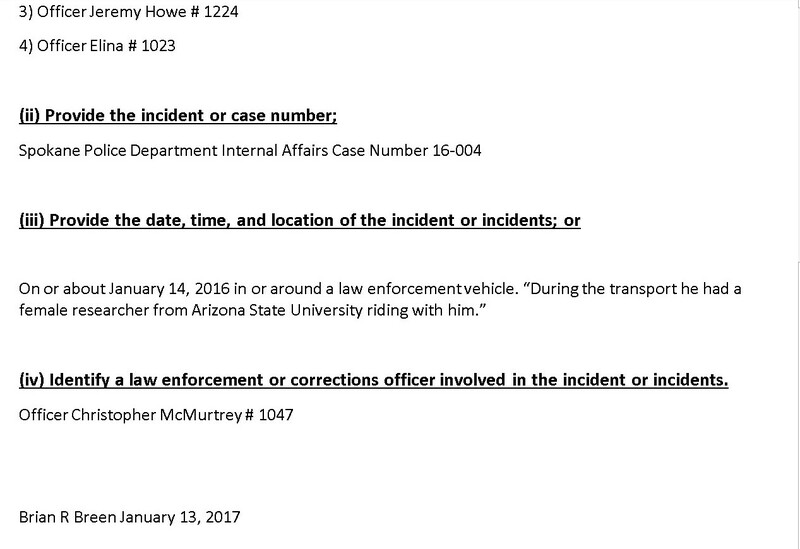 The fact that a “independent” witness happened to be a gal from ASU doing Body Camera Research on OUR dime makes it even more interesting.